Butler swept the singles matches with 6-0, 6-0 wins by Savanna Turner, Mercedes Belch and Sydney Hanratty on the way to a 4-1 win over Shaler. in a 3-2 win over Knoch. Butler swept the singles matches on the way to a 4-1 win over Knoch. The Knights did get a thrilling doubles win when the tandem of Rachel Sopcisak and Julie Kasunic edged Brooke Peitre and Tessa Klotz 7-6, 7-6. 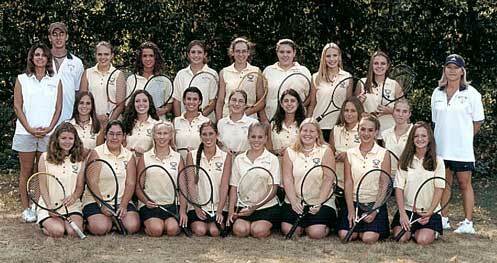 The Golden Tornado (5-7) swept the singles matches. Zoey McCafferty and Gretchen Wilson picked up wins at Nos. 2 and 3 singles to key the Tornado's season opener. Butler (1-0) will host Pine-Richland Monday. Courtney Gallagher, Laura Brestensky and Zoey McCafferty swept singles play for the Golden Tornado (2-4 in section play). Doubles: 1-Annie Ryan/Alexis Brockway (SV) def. Abbey Turner/Megan Kuntz 7-6(6), 4-6, 6-2; 2-Molly Moses/Rebekah Bright (B) def. Jenn Hutchinson/Alexi Pacinda 4-6, 6-4, 7-6(4). Butler (3-1) swept the doubles matches to down Hampton 4-1. 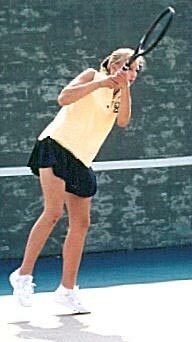 Singles: 1-Carolyn Shetter (B) d. Catherine Chen 6-4, 6-0; 2-Ellen Murray (H) d. Heather Santa 6-2, 7-6 (8-6); 3-Courtney Gallagher (B) d. Emily Dongiobanni 6-0, 6-1. The Tornado (5-2) swept the Raiders in this section match. "When freshman Carolyn Shetter earned the No. 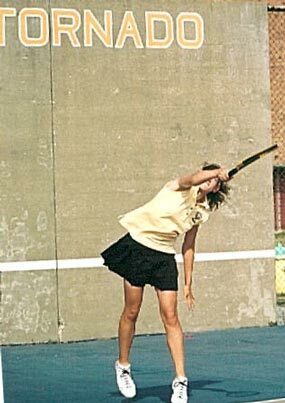 1 singles position for the Butler varsity girls tennis team this season, it knocked everybody else down a spot. 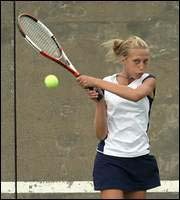 Carolyn Shetter, Madison Kerr and Heather Santa swept singles play as the Butler girls tennis team beat Mars, 5-0. 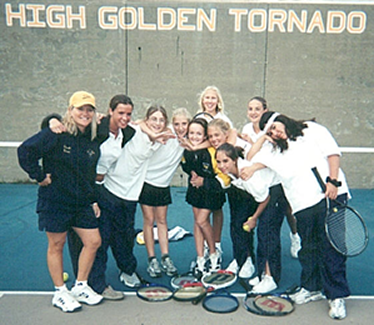 The Golden Tornado also received wins from the doubles duos of Jaime Daum-Rachel Wilson and Rosel Nesbitt-Shannon Gallagher. Shetter and Santa will represent Butler at the WPIAL Section 2-AAA singles event. Carolyn Shetter, Heather Santa and Courtney Gallagher swept the three singles matches to give the Tornado (7-8) the win. The Tornado wrapped up their regular season with a sweep against the Raiders. Butler (12-5, 9-5) will take part in the WPIAL team playoffs. — Butler's top doubles duo of Hannah Roccki and Katherine Sylvia won their match to help the Golden Tornado (9-4) snag this win, inching the team closer to a playoff spot. 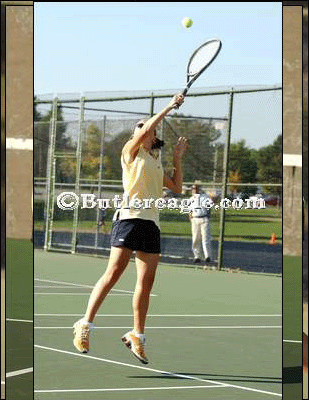 — Carolyn Shetter, Madison Kerr and Heather Santa each won their singles match with ease. In junior varsity action, Butler's No. 1 and No. 2 doubles squads prevailed to lead Butler to the 4-1 victory over Mars. 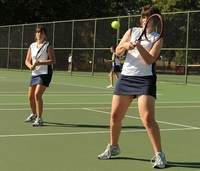 Carolyn Shetter, Heather Santa and Rachel Wilson defeated their respective singles opponents as Butler downed Seneca Valley 4-1. 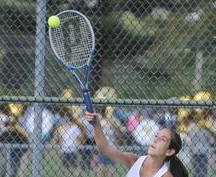 In the junior varsity match, Seneca Valley grabbed both doubles matches en route to a 4-1 victory over Butler. 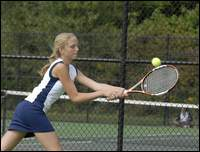 Carolyn Shetter, Madison Kerr and Heather Santa swept the singles matches as Butler dominated Knoch, 5-0. The Tornado's doubles pairs helped the squad defeat the Gators (4-1). 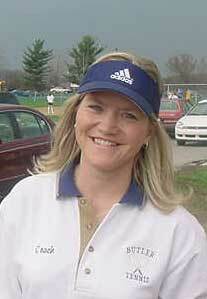 Carolyn Shetter, Courtney Kerr and Kristin Cypher swept the singles matches as Butler girls tennis team (1-1) picked up its first win of the season by beating North Hills 5-0 . Doubles: 1-Angie Byrnes-Maggie McGinnis (B) def. 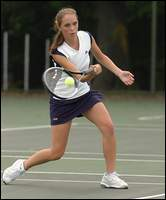 Maria Cardone-Marcie Held 6-3, 6-3; 2-Madison Kerr-Hannah Rocchi (B) def. Athena Pappis-Brianna Schapzel 6-2, 6-4. Butler dropped its match at No. 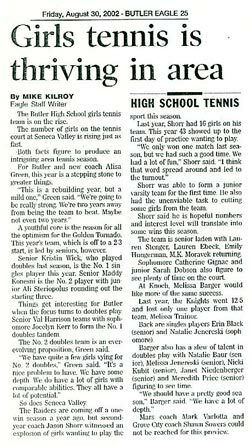 1 singles, then roared back to claim a 4-1 victory over sixth-seeded Fox Chapel in the first round of the WPIAL girls tennis playoffs. 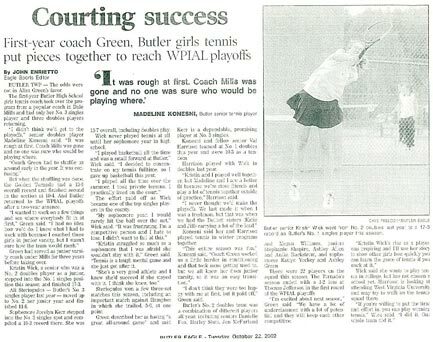 The victory marked Butler's first girls tennis playoff win this decade. 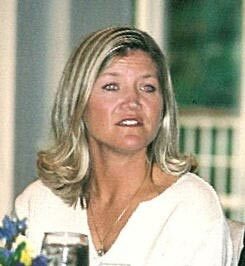 "We last made the playoffs in 2002 and lost to Thomas Jefferson in the first round,"coach Alisa Green said. "Our girls were so focused and ready to play today. We never had to go to a third set." Courtney Kerr and Kristen Cypher won at second and third singles for the Golden Tornado (14-4). Butler continues its playoff run at third-seeded Upper St. Clair. The Butler doubles tandems of Angie Byrnes-Katherine Sylvia and Kristin Cypher-Maggie McGinnis each won three-set matches to help the Golden Tornado to a 4-1 win over Beaver. Kristin Cypher and Maggie McGinnis won at No. 2 and No. 3 singles to key the Tornado's win over Beaver. The Golden Tornado swept their season's final match to close the season at 10-7 overall, 3-7 in section. 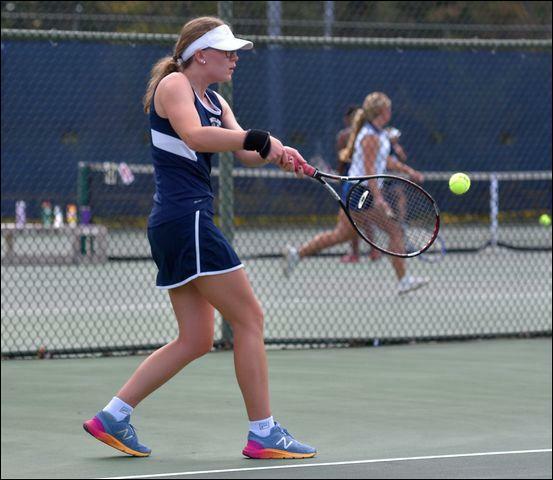 Melanie Sessa and Rachel Wilson won singles matches and Ashley Dill-Mandy Courson and Jaimie Daum-Jeannine Hollobaugh won both doubles matches for Butler's junior varsity (6-8). NOTE: To view up to date schedule you'll need Acrobat Reader.